At New Dawn Paving, we specialise in the installation of permeable paving. However, the product we install, Pebble Pave, also works as an extremely cost effective option for driveway resurfacing! Concrete driveways serve as a highly practical area, however, can over time deteriorate and fade from exposure from the elements, oil leaks, the weight of vehicles, stains, erosion and cracking. When making the decision to rejuvenate an old driveway, your options are limited. Choosing to replace it with a new concrete, stamped concrete, or exposed aggregate area will typically require you (or your contractor, at your expense) to remove the old area first before installing the new concrete area. Doing so can be quite costly, messy and time-consuming demolition. That being said, concrete resurfacing provides an option other than demolition. Permeable paving can be installed over existing concrete driveways, with the only preparation necessary being a bit of grinding on some edges and the installation of aluminium strip edging. 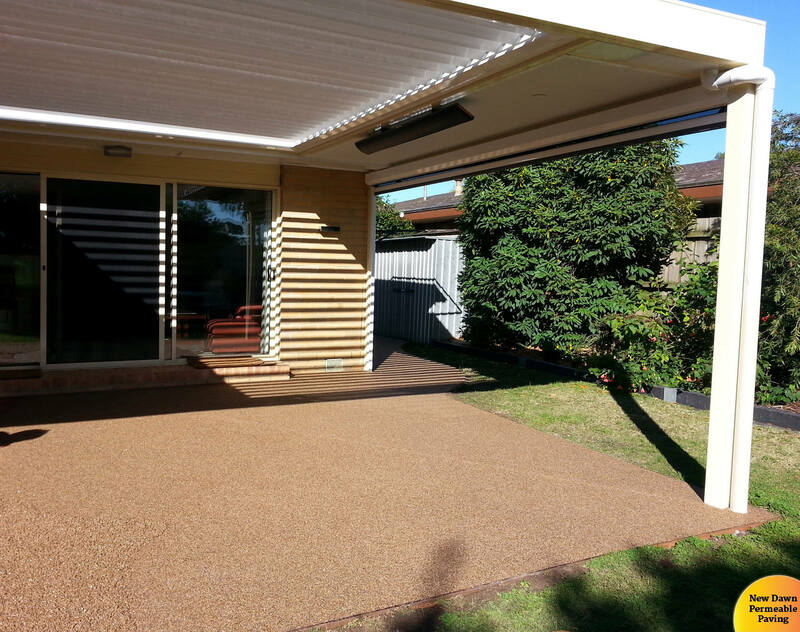 A three-part resin is combined with aggregate on-site, before screeded and trowelled level over the existing driveway. Often, the whole job can be completed in one day, with the surface ready for vehicle traffic after 48 hours. In the example provided, the colour installed for the clients was a blend of two of our aggregates – Dove and Pearl – and was to match a colour that they have chosen for other areas of their exterior renovation. In this particular instance, this concrete outdoor entertaining area was in desperate need of some love and affection. Resurfacing completely refreshed the area, and also allowed the addition of a new path flowing into the area and a slight enlargement of the original space. (The colour used here was Rosewood 6mm). Likewise, the following patio next to a carport was old and in need of repair. The brick tiles were extremely slippery, especially when wet. Our client had started to remove some, and discovered it was a very difficult job. Luckily, we are able to resurface old paved areas like this with no demolition. Brick tiles – old, dangerously slippery, and in need of resurfacing! With reference to the image below, you can see that the area is much more improved. The textured surface of the permeable paving has made area much less slippery than the previous surface. The colour, Charcoal 3-6 mm, was chosen to be a neutral backdrop to their outdoor furniture that they have outside normally. A newly resurfaced brick patio. Despite all this being said, you can’t please all the clients all the time. When resurfacing, the client’s cat had to unceremoniously removed from his favourite hide-out before we could do our concrete cutting. Luckily, he was more than impressed with the finished result! 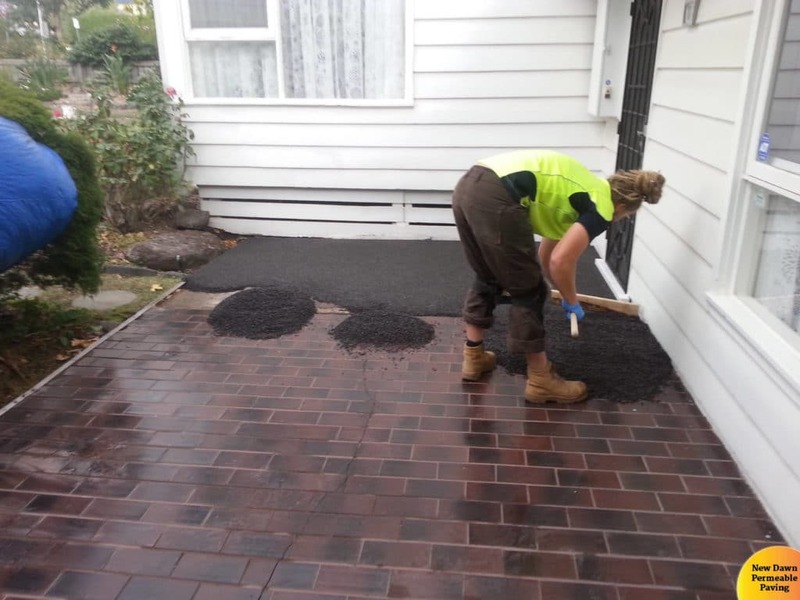 Contact us about driveway resurfacing and let permeable paving change your driveway!